Imagine opening a new box of Crayola Crayons. You see purple, orange, yellow and white. Now, imagine finding a special spot on earth that looks like a box of crayons. Welcome to Paint Mines Interpretive Park. 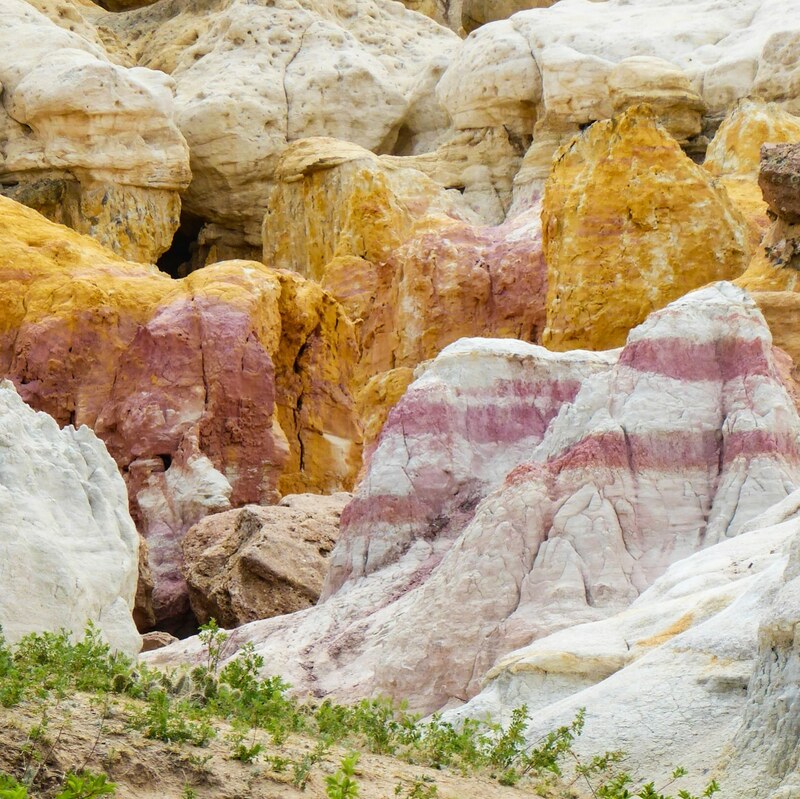 Tucked away in the eastern Colorado prairie, Paint Mines oohs and awes with sandstone rock splashed with bright colors that only nature could make. There are many attractions throughout the world where you can see rocks painted by people. 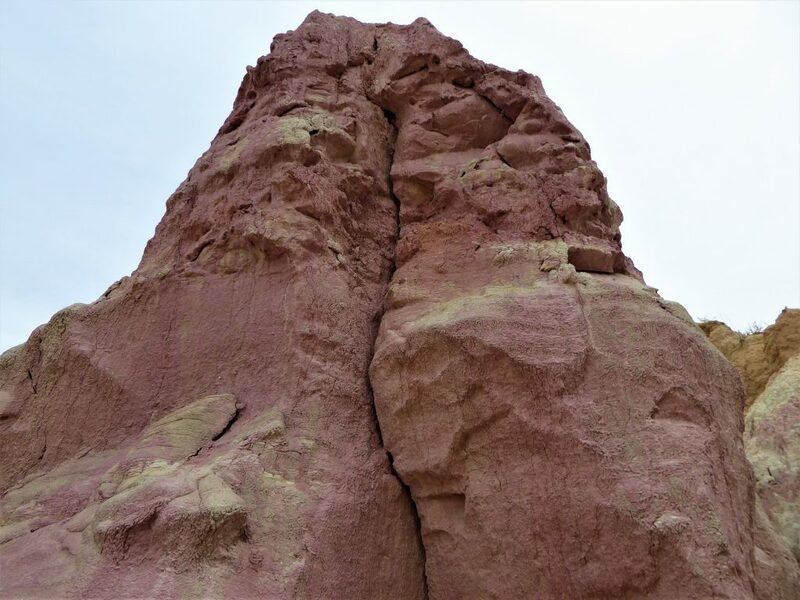 There are fewer places where you see rock formations naturally dyed in vibrant colors. Sure, you can visit sites with amazing rocks all colored in the same hue, but Paint Mines allows you a feast of optical multi-hued wonders. 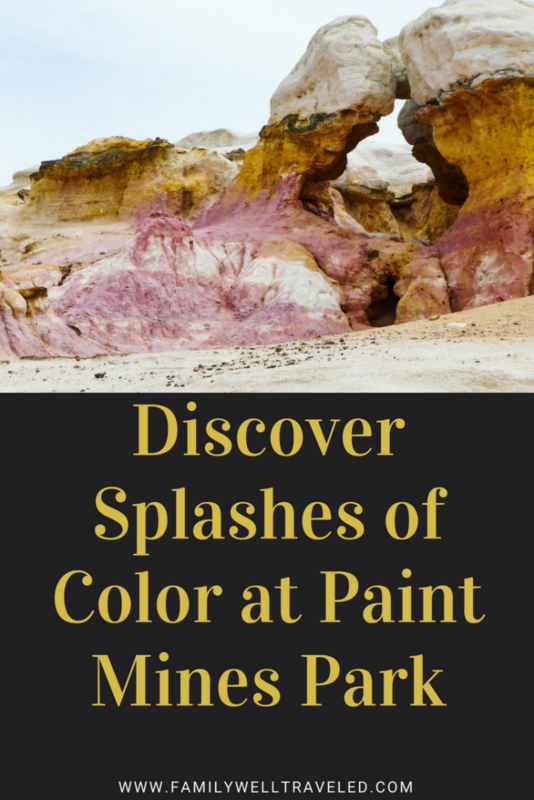 But, Paint Mines Interpretive Park is not just about the unbelievable splashes of color. The rock formations themselves look like sculptures carved by a master artisan. The drive to Paint Mines likely will take you longer than the time you spend in the park, but the impressions left by the park will last a lifetime. What Are the Paint Mines? I’m always on the lookout for a different place to visit with the family on a day trip. While searching Colorado day trip destinations, I stumbled upon an unusual county park located east of Colorado Springs. The 750-acre open space park in El Paso County is off of U.S. 24 East just outside the small town of Calhan. It is FREE to visit Paint Mines Interpretive Park. The geologic formations, which include spires and hoodoos, have attracted human visitors for at least 9000 years. The Paint Mines are formed by selenite clay and jasper. Rain erodes the clay and oxidized iron compounds produce the colors that have been used for centuries as dyes by Native Americans. Erosion continues today, and you will find evidence of runoff during a visit to the park. This runoff creates many walking paths and trails that lead you into the shaded crevices of the rock spires. Are We On Earth, or Another Planet? As a family, we have traveled to many places where we have asked ourselves, “Are we on earth, or another planet?” Paint Mines left us with the same impression. Walking through the park feels a little like being on another planet. The hoodoos remind me of something from the set of an old Star Trek episode. 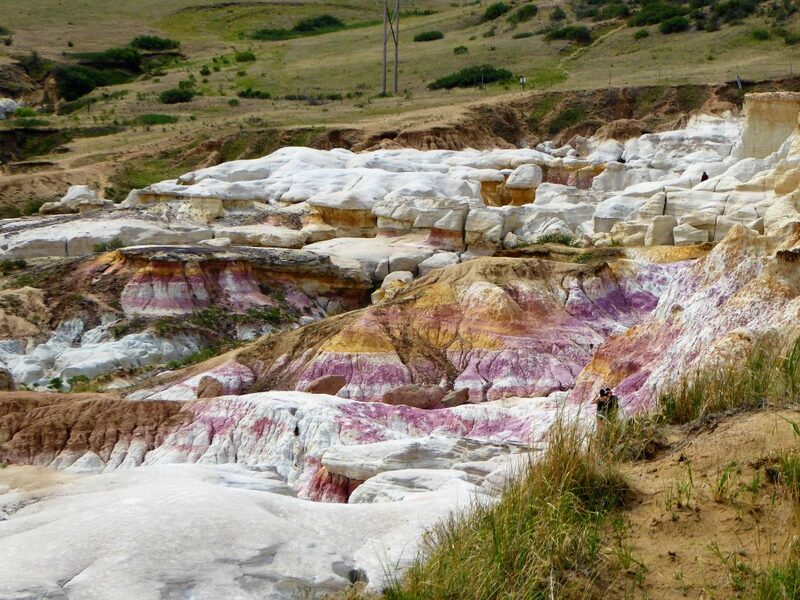 You can only imagine what people who stumbled upon Paint Mines many years ago thought of the scene. Did they consider it a sacred place? Did they create myths to explains the colorful spires in the middle of the prairie? 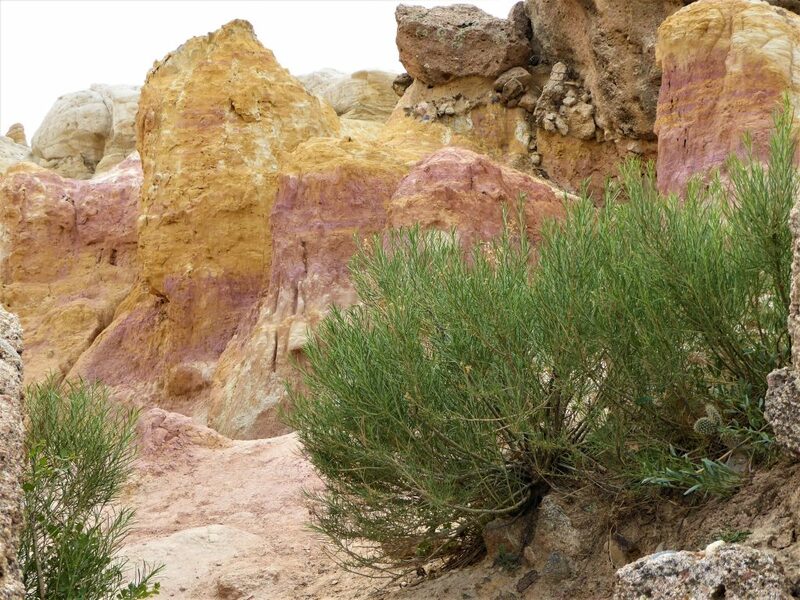 Obviously, the colors of the rocks are the main attraction at Paint Mines. However, we found a number of blooming plants in the midst of the dusty park. You have to marvel at the tenacity of these plants that can withstand long periods of dry heat only to drink from the rapidly evaporating rains of a prairie storm. 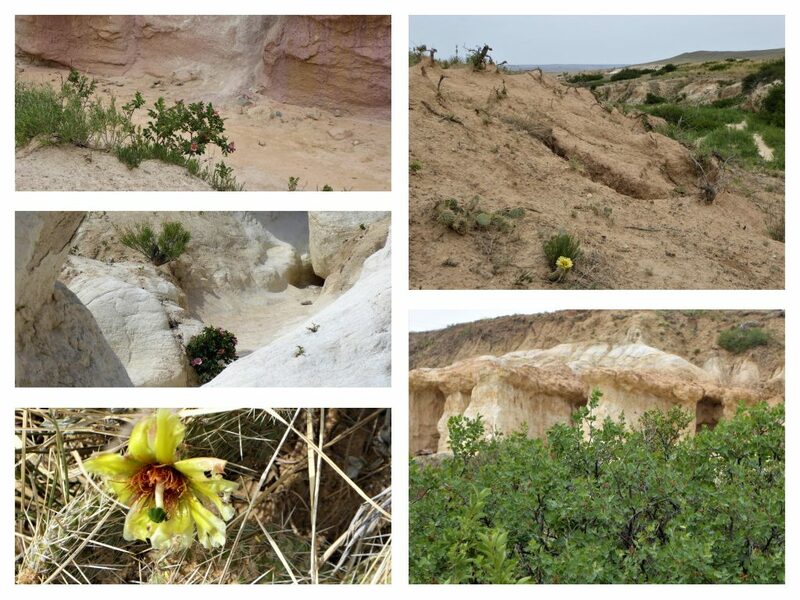 In this rough terrain, it’s is a welcome surprise to see the blooms and their interplay with the colors of the rocks. Some of the colorful blooms that complement the rocks. We also catch glimpses of wildlife throughout the park. Ephemeral lizard prints line the white chalky trails skirting the rocks. The song of an unseen lark bunting, Colorado’s state bird, glides over the valley. 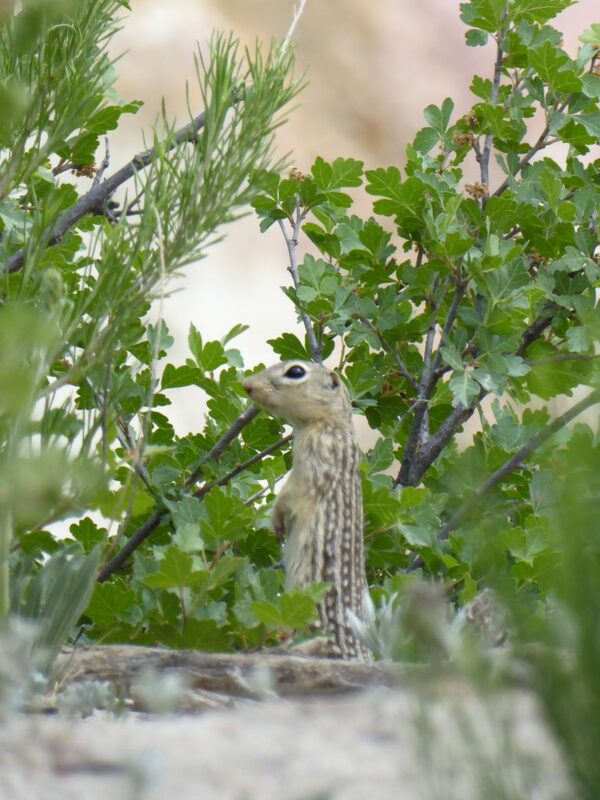 We catch a glimpse of a friendly chipmunk on its hind legs, tentatively watching us. We witness the holes for rodents and snakes among the trails. 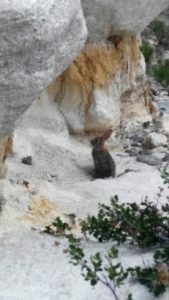 And on the rocks, we watch a rabbit hop in and out of view. We visited Paint Mines Interpretive Park on a Saturday morning. Surprisingly, the entrance parking lot was full. We did not expect so many people to be touring the park. We got out of the car, stretching our legs and making the mandatory restroom stop. During this time, we spoke with a man who gave us a great tip. The trail to the hoodoos from the main parking lot is about a one-mile walk. The trail includes interpretive placards telling about the mines and about those who visited the mines over the millennia. The man, however, told us that if we drove a short distance up the road, we could park at a second parking lot that directly overlooks the colorful spires. The day was hot, and most of us were unwilling to make the walk through the sun-drenched trail, so we drove to the second parking lot (which was empty) and walked down to the rocks that highlight the park. The trail from this second parking lot was slightly steep, and I walked down ahead of my kids lest they take a tumble and slide down the incline. We were thrilled that we took the shortcut and had more time to explore the park. Calhan is a small town two miles from Paint Mines. You can get snacks in town, but we recommend bringing snacks with you. And water. Bring water for your walk and tour. There are no places to fill up a canister within the park. There are no trash receptacles inside the park. Plan to pack in and carry out. Pets are not allowed in the park. However, we witnessed people ignoring the posted signs and taking their animals on the trails. There are a couple of Geocaches within the park. Bring your phone or other GPS device to locate them. Get clear directions before you set out. There were no road signs going eastbound on US 24. We had mapped out directions before our trip so we knew the towns we were passing through and the approximate arrival time. It was disconcerting having no road signs. There were road signs going westbound on US 24. Climbing on the rocks is prohibited. Stick to the trails throughout the park. Removing items from Paint Mines in prohibited. Look. Enjoy. Allow others to do the same. Plan for 1-2 hour visit in the park. 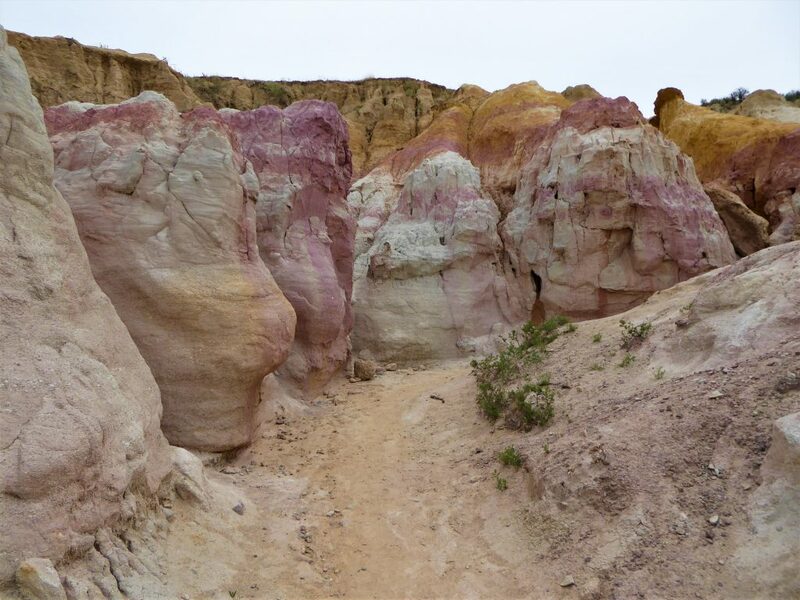 Did you enjoy this tour of Paint Mines Interpretive Park? Leave us a comment and let us know your thoughts. All photos and content are by Family Well Travel and use of photos or content without permission will result in legal action. Wow this is awesome. This is the first I’ve heard of this place. Definitely seems like it’s worth a visit. It’s not on many people’s radar, but it’s definitely worth a visit. I love the color of the rocks. Your advice to find the back entrance on busy days is super helpful. There are hikes like this that are beautiful and everybody knows it. Being able to fit a parking spot is critical. We were fortunate to learn about the back entrance. We definitely appreciated that tip. Fascinating geology. nothing inspires like nature. I love how you saw wildlife in the rock formations that look a bit inhospitable. Showing that nature will always find a way. 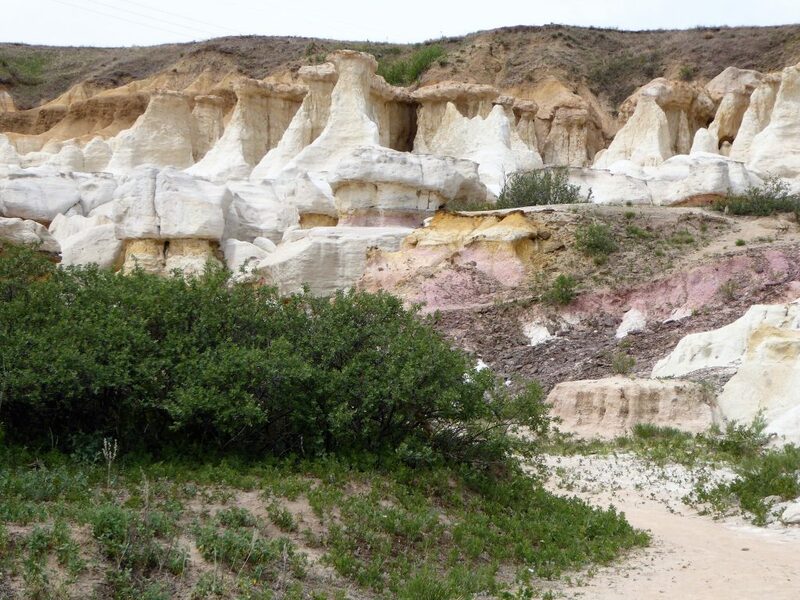 We were surprised by how much wildlife and vegetation we found among the Paint Mines. Oh my gosh! What a beautiful location! I love the analogy to a box of crayons. I can’t imagine stumbling upon this in my journeys. Thank you. It really does surprise you to see such a diverse place at this location. This reminds me of the Paint Pots in Yellowstone for the same reason-beautiful and reminded me of a box of crayons…well, those and rainbows! Also reminds me of a couple of places I saw in the Badlands too. 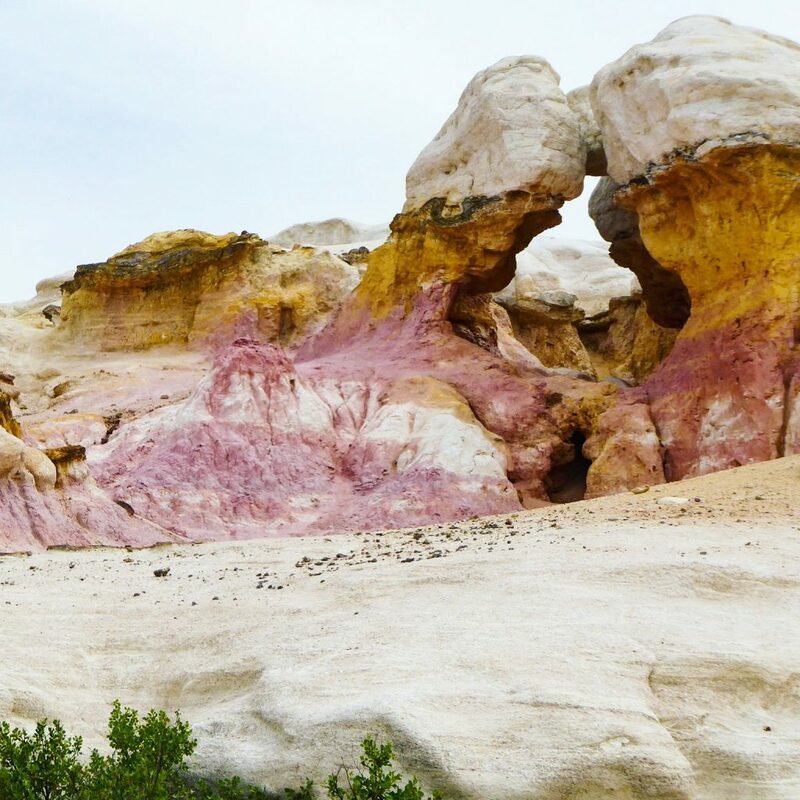 Your photos captured the colors and beauty of the paint mines really well! Aww, that chipmunk…I just want to scoop him up and hug him (and then I come back to the reality of how much he would like that..LOL). The colors really reminded us of the Badlands and Paint Pots too. So many colorful places to see in the world. Wow, I would go mad photographing such a place. These natural rock formation is unbelievable. Would love to follow your secret path while exploring this place. Good that climbing is prohibited. Nature is so mystical and nothing we do can ever compare to her creativity. The colors are so light and delicate. Despite being so dusty and blank, it is lovely. I love Colorado but have never made it to the paint mines. Gorgeous! Great info. I’ve honestly never thought to visit Colorado and boy is that changed now! This kinda reminds me of the rainbow mountain in Peru with all the colors and it’s truly amazing what nature is capable of. Looks like a great place to run into some cute animals too. Definitely worth the long drive for sure!